Jerry, Cody, Matt and all the staff answered all our questions throughout the whole process! Never have we seen such dedicated and complete customer service. Jerry was available to answer phone questions during the building process too! The directions were a breath of fresh air. I'm sure most people know what I mean when I say that most items you have to assemble these days, if they even come with a manual that's not online, are impossible to decipher! Reading through the MusicMakers instructions was like having someone who speaks your same language talking you through each step. We are so thrilled with our Voyageur harp! Thank you, MusicMakers, for making this possible for us! Jon Lindblom, piano technician and rebuilder. 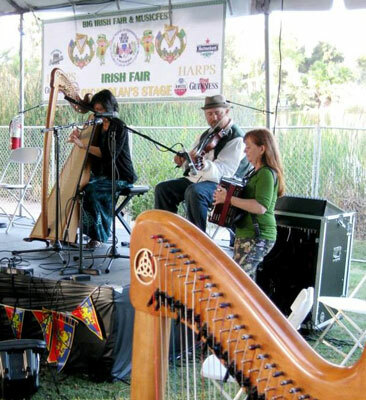 Here's a photo of me playing my wonderful Voyageur Harp at the Irish Fair in Long Beach, CA on June 15. I love this harp!! Also in the foreground is the neck of my student Diana McCarthy's Voyageur. Thanks for making these gorgeous harps! This harp is replacing a harp that I had to sell a few years ago when the economy went south. I only had that harp for one year, I had been taking lessons and really loved it but my husband, who is a carptenter, had been laid off with no work prospects and we needed the money so I had to sell it. I didn't think that we would be able to afford to get another harp and that I would have to let that dream die, but then I heard about Musicmakers Harp kits, and now I have a harp again! I forgot to mention that I am playing and loving my Voyageur harp, made by Melanie Wiltse of Stevens Point, and one of my students is playing and loving her Limerick Lap harp. My other student is hoping to save up for the Smartwood harp, but he is a high schooler who doesn't have a job yet! Still hoping! But he loves playing Irish jigs! Rose (my Voyageur harp) and I have been playing Christmas music for friends and a nursing home, and we will play with a flutist in church this coming Sunday, since we were snowed out last Sunday! I have been extremely satisfied with the entire process of purchasing a finished Voyageur harp. From questions prior to purchase, through assistance selecting and having you create a custom decal, to receiving my finished harp in perfect condition by way of FedEx, I can only say it has been a delight working with you. I couldn't be more pleased or grateful for your steadfast assistance from start to finish! My Voyageur harp is simply lovely; its sound is outstanding! My harp teacher was amazed with its sound. I'll end with her words of praise for your Voyageur harp: "lovely and remarkable"! Your work is better than mine. Your tolerances are tighter. Your roughwork is cleaner, better measured and more predictably square than almost anything I�ve built. I pride myself on my exactness. I think you just might have beat me there to. So far the only adjustments� I�ve had to make is some edge planeing on the soundboard to� fit it. The soundboard was a bit large. Perhaps a 1\16th�over. Anyone could have used a belt sander or even hand sanded it down. I�ve got the sound box together and most of the sanding done. I am chomping at the bit to get it strung and get to playing! Thank you so much for producing such a quality instrument in a kit! My harp kit became a family project: husband, Gary was the assembler, son-in law, Rusty, the sander, daughter, Tracy, was quality control... She made her Dad follow the instructions to the tee! I watched my harp quickly take shape and after it was all together it was wonderful to begin to put the strings each on and tune it up for a first hearing. Not only is the Voyager beautiful to look at but beautiful to hear. Thanks you for making the kit with easy to follow instructions and so affordable. I play professionally for weddings, dinner parties, funeral grieving services around Christmas time, and for many church events in my area. I got my start about 12 years ago when I purchased the cherry Limerick lap harp with wire strings from Musicmakers as my first harp. I still play it often, but now really enjoy the deep, rich tones of the Voyager harp. People always comment on how beautiful the music of the harp is and they are truly blessed by it's sounds. After I tell them I bought it from a kit and my family built it ..they are more amazed! I am a 54 wife and mother and a music student at Henderson State University. After graduation in December 2008, I plan on teaching voice and harp in my home studio. I don't have to even think of where I will buy my studio harp instruments or kits: it's going to be from Musicmakers! My husband, Fritz built this harp for me. He had previously build two of your harps, the Limerick and the Regency from your blueprints.When I first told him about the Voyageur and that is was only available in "kit" form he was not totally enthusiastic about building it. Perhaps, it was not enough of a challenge for his craftsman's nature. But I have to tell you that now he is very impressed with your product and brags about it to friends. The hardest part was painting my harp because I dearly wanted a purple harp. We actually ended up having friends of ours paint it at their auto body shop! I was lucky enough to find a local artist who was willing to do the design on the soundboard. Now that it is finished the harp is gorgeous and the sound is enchanting. Thank you so much for all your help. One ambitious High School Senior chose to build our Voyageur Harp as his senior project. You can read about his experiences by checking out his blog. What a remarkable kit you have designed in your Voyageur Harp!!!! I have never seen anything cut so accurately. The real test of a harp assembly shows up so quickly at the neck/pillar assembly and what you have pulled off is ingenious in concept and so well executed that it glued up effortlessly! I am mind-boggled that you can cut the butterfly joint so accurately. HATS OFF to you and your crew! With such a harp offered in a kit form anybody that is smitten with the "harpdream" bug need wait no longer. I just bought a Celtic harp for over $4,000 and can hardly wait for a play-off with your beautiful kit harp. Thank you for a great harp. Enclosed are the pictures I promised to send you upon its completion. Everyone who has seen the harp has exclaimed how beautiful it is. But the big bonus is the full bodied and balanced sound that it produces. It compares favorably to harps costing thousands of dollars more. This is the third harp I have made from Musicmaker's plans or kits. I have also made three Bowed Psalteries, two Hammered Dulcimers, and one Mountain Dulcimer. I don't know which is the most fun, making musical instruments, or learning to play them.